WASHINGTON — Concern in the White House about President Donald Trump's fitness for office has become so great that members of the administration routinely talk about a constitutional solution, the author of an explosive new book claimed in an exclusive interview on "Meet The Press." Michael Wolff, the author of "Fire and Fury: Inside the Trump White House," alleged Sunday that the 25th Amendment, which would allow the president's Cabinet to remove him from office, is a concept that is "alive every day in the White House." Wolff said White House staffers he talked to would say things like "we're not at a 25th Amendment level yet." Others, he said, called Trump's behaviors "a little 25th Amendment." 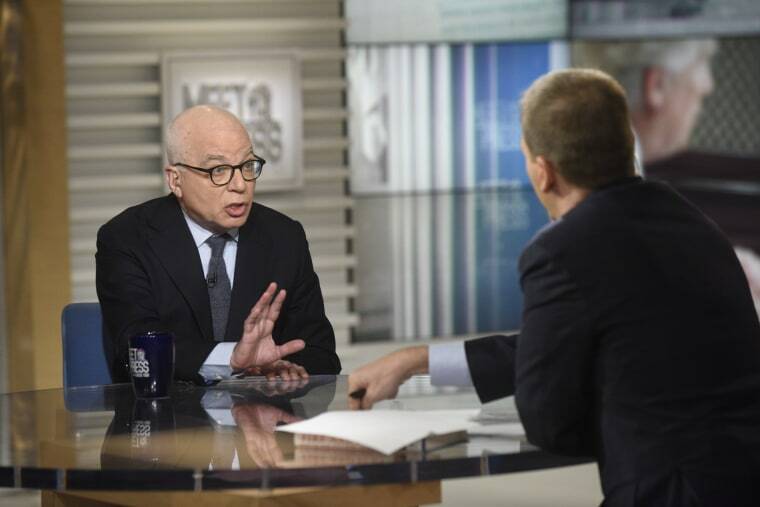 Wolff, who has come under heavy criticism from the White House for the book, said he did not leave out positive perceptions of Trump to paint a negative picture him. "If I left out anything, it's probably stuff that was even more damning," he said. "It's that bad." Wolff defended his tactics in gaining enough access to the White House that he was able to speak very freely with numerous top administration officials. "I literally kind of knocked on the door and said, 'Can I come in?' and they said, 'OK.' And I came in, I sat on the couch, and that's the point of view I've written this," he recounted. "I went into this with absolutely no agenda whatsoever. I have no particular politics when it comes to Donald Trump. This is really all about human nature." Trump has threatened a lawsuit against Wolff, and the White House has taken major issue with the accuracy of many of Wolff's assertions, including numerous misidentifications and other components in the book that could have been fact-checked. The president wrote in a tweet last week that he feels "Michael Wolff is a total loser who made up stories in order to sell this really boring and untruthful book." White House officials who spoke with NBC News were adamant that the last time Wolff spoke with Trump was in a phone call on Feb. 6, 2017 — 17 days after Trump's inauguration — something they also say Wolff has acknowledged in writing. Wolff said Sunday that "there were several other moments after that" when he spoke with the president but that "he probably did not think of them as interviews" and instead were more informal conversations in places like hallways. Wolff acknowledged that he never spoke with Trump inside the Oval Office. The author also claimed that he did not violate any "off the record" agreements with his sources but instead tried to blend in with work as usual in the West Wing. "I tried to be inobtrusive," he said. "So I tried not to have anyone quite notice me, or not notice me above the level that they notice the furniture. So my goal was to keep going until somebody said go away." NBC News has not confirmed much of what appears in the book. The White House has called the publication "fiction."